This post was supposed to be a video of how to make yummy healthy raw chocolate. I got it all on film, even though the tri-pod decided to completely collapse into a heap of metal. But now my laptop has decided to be difficult, to make a long story short the audio doesn’t match the video and now I’m giving up. Aaaaarrrrggghhh! The thing is I’m slightly short of time, as usual. A taxi is picking me and the 8YO up at 4.45am (in exactly 6 hours!) we are off to Chicago and I have obviously not packed. Most of the stuff that I’m planning to bring has actually just been washed, the radiators are covered, the dryer working on full capacity. Stress stress. Onwards & Upwards …the chocolate was divine..I will try to salvage the edit when we are back home again. Next to my bed I have a Himalayan Crystal Salt Lamp. It’s basically a lump of salt with a light bulb in the middle. 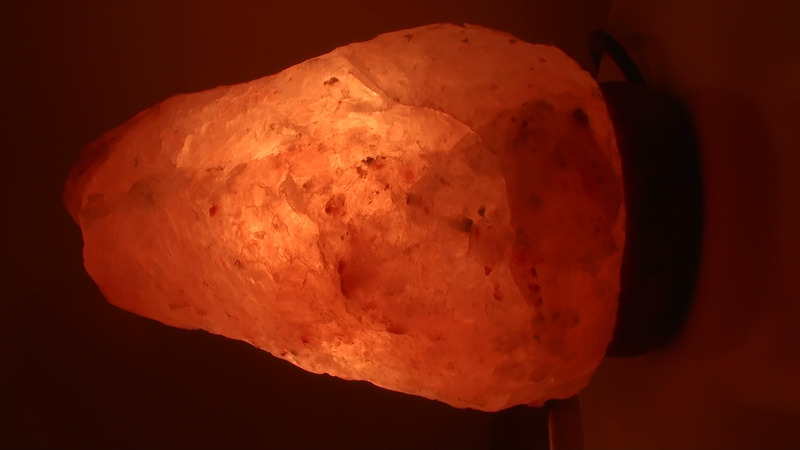 I love the soft glow it gives off it keeps me calm and it also helps to create negative charged ions into the room, making the air more healthy and easy to breathe. You know the calmness that washes over you when you stand next to a waterfall, it’s the negative ions that have that effect, making you feel good. I wish I could bring it with me on the long haul flight tomorrow. Found your blog through the interview on MBC. Have a great visit to the U.S. Love the lamp, too! I was suggested this blog by way of my cousin. I’m no longer positive whether this submit is written by him as nobody else realize such exact approximately my trouble. You’re amazing! Thanks!